It hit me the other day that this year has flown by like a giant mythical bird and it's now August!! You really know next year is approaching when diaries start appearing. When they do I always watch out for the Quilters Companion Diary to see which wonderful quilt they have chosen for the cover. They make their choice from the hundreds of patterns and projects they publish in their magazines. With lots of beautiful quilts to choose from I don't know how they decide. So you can imagine my surprise and joy to discover they've chosen my quilt Yoyos a la Mode for the cover of Quilter's Companion 2017 Diary. Oh my goodness - what an honour!! I keep alternating between happy dancing and pinching myself to see if I'm dreaming. It's certainly makes a bright and happy cover and will hopefully make people smile when they jot down important dates throughout the year. or watch out for it in newsagents. 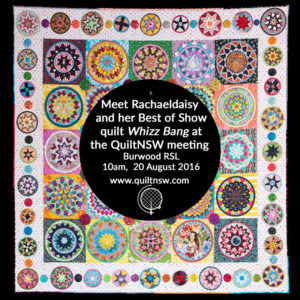 As for fun dates , I'm looking forward to being at the QuiltNSW meeting this coming Saturday with my Whizz Bang! quilt. The guest speaker of the day is Sarah Fielke. Elaine Lye will be doing a demonstration of embellishments and necklaces with buttons and beads. And the pop up shop is Kate Quilts. All in all it promises to be a fabulous day. Congratulations on all you Celebrity! Oh Rachel! I am sooooo happy for you! And it is so deserved! Your work is just stunning....and so original! I gasp in awe. You are such a bubble of personality and talent! I bow at your feet!!!! And thank you for sharing your trip photos. The historical quilts are some I would never see otherwise. I have scoured over them in great detail....savouring every moment. You make my mountain home seem not so far away! What a glorious thing this internet is! Thank you! Thank you! Woohoo! How exciting! I have used the AQS desk calendar (in my sewing room to keep track of what I am working on) every year since 1988. I already have my 2017 copy, but I think I will have to own two "diaries" this year as I will surely buy this one too! No surprise. 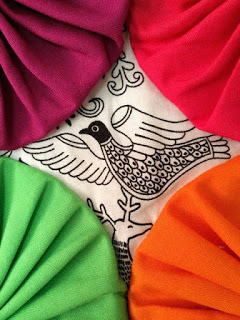 Your quilts are delightful, fresh and just totally awesome! Congratulations! How exciting for you, congratulations! Sarah spoke to us last spring, she is lovely! Whoo-hooo!! Congratulations cover girl, you deserve it! Congrats Rachael. A worthy quilt for the cover. It is a beautiful, colorful (of course) and just so very fun! I'm very happy for you and it's well deserved ! No doubt about that ! Congratulations on the cover, it looks wonderful! I am sure it will add pretty pop of color to many desktops next year! Congratulations Rebecca. Welldone and totally deserving! I wish I coyuld be at the meeting, but its a bit far to come from Auckland! OMG how fabulous.....just getting better and better for you! WOOOOO HOOOOO!!!! Congratulations!!! pinch pinch... you aren't dreaming!!! Savor the joy girlfriend, you deserve it!!! Congratulations - and wat a lovely shot of your Yo Yo quilt draped over the white wicker chair, very inviting! Sounds like you're going to have a fun day, hope you'll tell us all about it! So excited for you getting more and more famous every second.....Tried to book a flight to your presentation, but durn it..the flights were full..EVERYONE wants to meet the one and only Racheldaisy!!! Hugs of happiness for you. How exciting to be featured on the cover. You deserve to be proud, as it does give a nice, cheerful feel to the diary. Congratulations! 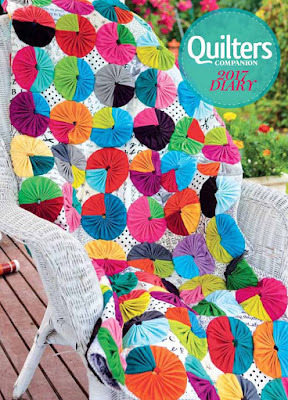 Your quilt looks lovely & cheerful on the cover, so exciting for you! Saturday sounds like an awesome day - have fun !! 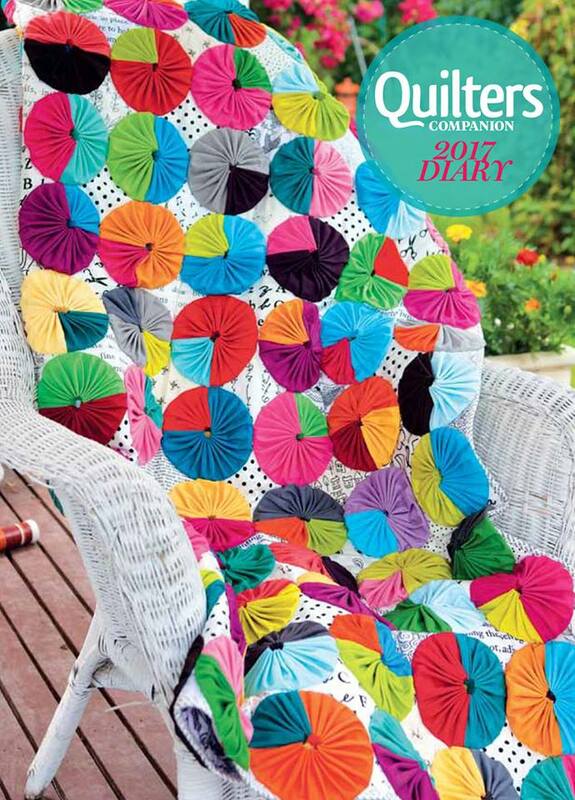 and how exciting to be on the front cover of the 2017 diary - woohoo - such a fun and colourful quilt ! The excitement never ends. Another wonderful achievement on your part. I can wait to see them in the shops!!!! Congratulations. Congratulations on making the calendar cover! No surprise that they chose such an optimistic, uplifting quilt though. It's a beauty! How wonderful! 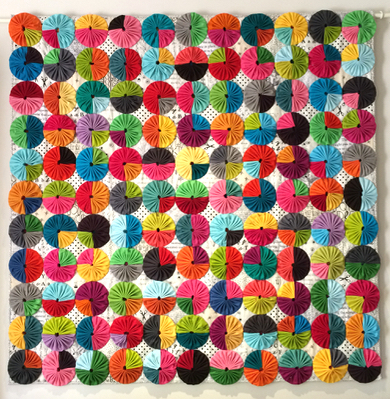 I can't think of any quilt more happy and bright than this one. So many people will get to see it every day. It will surely bring them smiles throughout the year. Yea! Oh that is too exciting - congratulations, hon!